My cousins who remember her well tell me that my oldest sister Mary, who was born three years before me, was the nicest, sunniest little girl and everybody loved her. 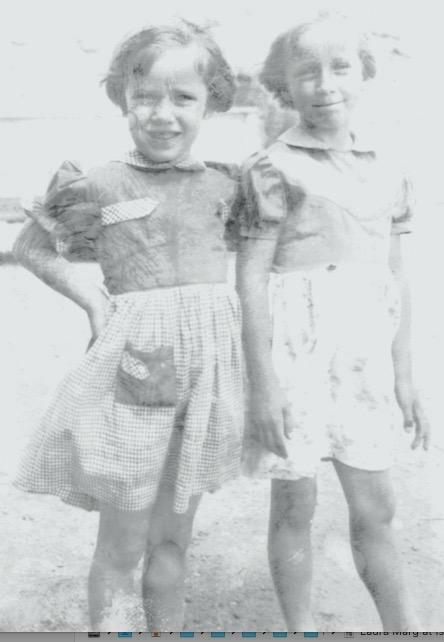 My two older sisters, Mary on the left. She died at age five from a brain tumor, one of the kinds specific to children that is curable today. Back in 1953 it was considered inoperable. However, there was a doctor from Germany who was pioneering that type of surgery, so it was decided that my parents would take Mary to Boston and meet him there to do it. They went by train, and I never asked why they didn't fly, maybe there was concern about the change in altitude affecting pressure on her brain. It was winter, and Mary had been sick for several months with my mother taking her to Childrens Hospital in Denver, 60 miles away for treatment so there wasn't time to go shopping for a winter coat for the train journey east. She borrowed a coat from our farmer's wife, and when they arrived in Boston, my dad's younger sister, an art history student at Wellesley met them - she criticized that coat - not stylish enough, what was my mother thinking. It's funny how we carry those sorts of things through our lives: my mother never forgot it, and built onto it with further slights as the years went by. They made it to the hospital, but Mary died before any doctors could see her, and her funeral was held at our home. Mary's symptoms started in late spring, and when my mother's youngest sister Dot graduated from high school, their aunt, whom my mother never liked very much, brought her up to our part of the state on a graduation tour. My mother asked if Dot could stay behind and help her cope with things, because my other sister was 3 and I was 2. But the aunt wouldn't let her stay, took her back to the trading post. My mother's mother must have felt guilty about this, because she came up and took care of us for a while before my parents took Mary back east in hope of having the brain surgery. My sister told her: "you're not the mother to us, you're the grandmother to us" one time when we didn't want to do something she told us to do. And she and I had issues because I always 'read' myself to sleep with a 'book-o' - a copy of the Reader's Digest that I had to have in my crib to leaf through before nodding off, and nobody warned her about that, so she was afraid I wouldn't be able to go to sleep with that distraction. Since both my parents were gone, I don't know if anyone knew to tell her about it. 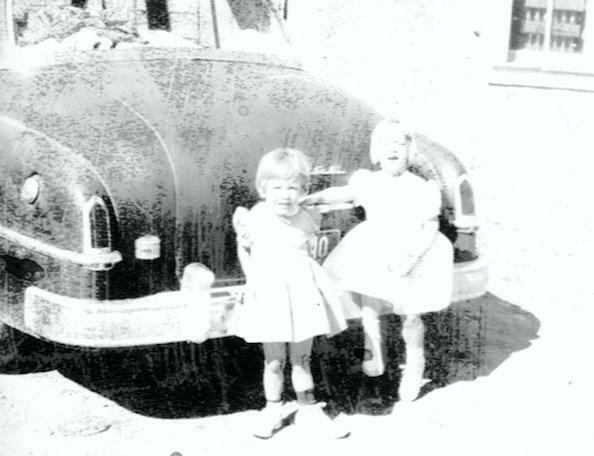 My mother felt badly that Mary died before my mother's parents ever got to meet her, so she vowed to make sure we would get to know her side of the family, and every summer she took or sent us down her childhood home. On the way there, we dropped in on various friends and relatives, and that way we got to know our extended family fairly well. 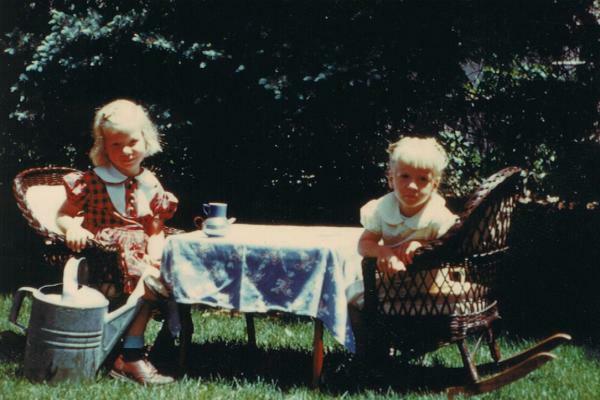 Photo: My sister and I down at my mother's childhood home. It was windy a lot, and we had to wear dresses the whole time because the local Indians were offended by girls wearing slacks and shorts. 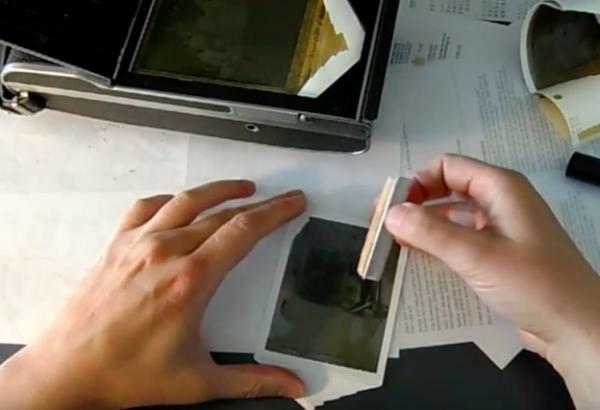 These pictures are washed out and funny looking because my grandfather had one of the first versions of the Polaroid camera, the kind where each picture had to be 'fixed' by drawing a bar of chemical over it. My grandad loved to take pictures with that camera, especially of his customers, members of the Navajo and Ute Indian tribes. It must be strange and sad to remember this long-ago tragedy. How your parents must have suffered. These photos could almost be of my own siblings, except of course my father wouldn’t allow any of us girls to get haircuts. Would have been so much easier than dealing with the horrible knots and tangles. My brother, 5 years older than me, died this past May 16,and though we were never close he was always my 'older brother'. Sorry you never really got to know Mary but it is nice that you have pictures of her. It is heartbreaking to lose a child. Your mom must have had a really hard time of it after that. The pictures are lovely and I am so sorry you lost your sister.